BAYAN USA protests Philippine government repression | Fight Back! 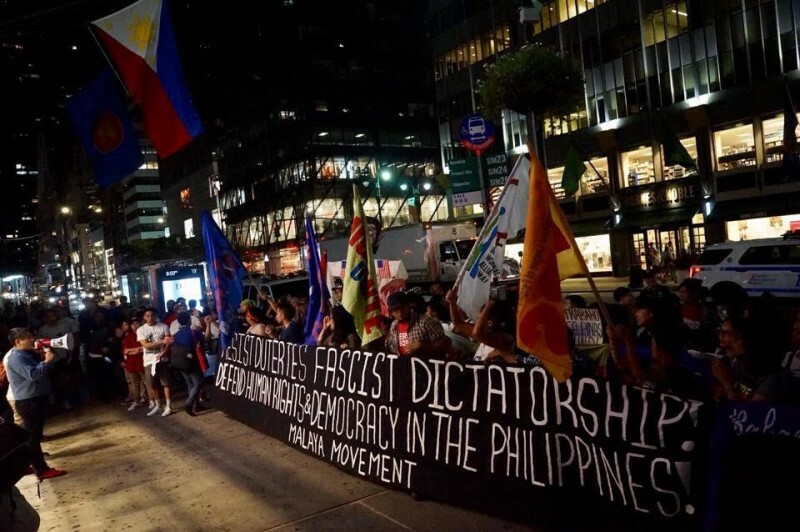 New York, NY - Over 200 people gathered in New York City on Sept. 16 to protest against the U.S.-backed President Rodrigo Duterte’s government of the Philippines. The action was to bring attention to the extrajudicial killings in the Philippines, the crackdown and murders of opposition leaders, poverty, and the martial law that is currently in place. BAYAN is a national alliance of progressive Filipino organizations. The protest was the conclusion of BAYAN’s 6th Congress, which included their various affiliated groups from across the country. The first part of the action took place in Grand Central, where there was a mic check and banner drop. The powerful chant took over the building as the words, “From Iraq, Palestine to the Philippines, stop the U.S. war machine!” rang through the historic building. The crowd then walked to Pershing Square, a symbolic location because it was named after General John J. Pershing, the U.S. Army officer who oversaw the slaughtering of the Moro people during the Philippine-American War. After some chanting, the crowd marched to the Philippine Consulate General. After arriving, various BAYAN organizations gave speeches about the conditions in the Philippines. Organizations represented included Migrante USA, Gabriela USA, Anakbayan USA, and Malaya Movement. Along with BAYAN speakers, organizations in solidarity with the movement also spoke, which included Committee to Stop FBI Repression (CSFR), Within Our Lifetime, and International Action Center. Jake Holtzman gave a speech on behalf of CSFR. “We need to do everything we can to protect and support the activists and revolutionaries who are doing the real work that will help liberate the masses in the Philippines,” said Holtzman. 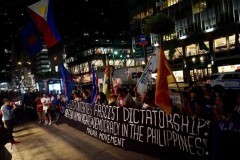 The action ended with people hitting a Duterte effigy with their organizations’ flags and a determination to continue fighting back against Duterte and U.S. imperialism.